Cardboard is a great medium to work with for many craft projects and a vase is a great example. 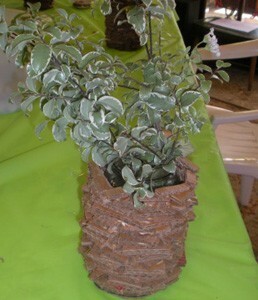 This is a guide about making a recycled cardboard vase. 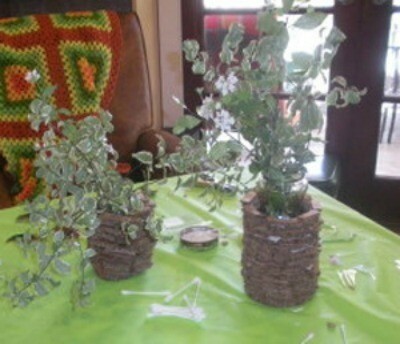 This is a really cool use of recycled cardboard and a very funky way to display flowers in your green home. Start by using a marker to outline the circumference of your jar for the base of your cardboard vase. I used an 8 inch round salsa jar. Cut out the base, leaving about a 1/2-inch border around the marked circle. Cut your strips the 1/2 long strips into 1-1/2-inch pieces. Your pieces might have to be slightly bigger or smaller depending on the size of your jar. Figure out how many cardboard pieces you need to go around the base of your vase, making sure your jar will fit. I lined them up on bottom, touching the top right corner of one piece to the top left corner of next. Glue the pieces to the base. I lined up top corners of each piece around. Use only a small bead of glue on each cardboard brick so that the glue won't squeeze out the sides. This will keep the vase neat. Glue the second layer down using a brick like pattern. Each piece fills in open space from previous row, to add support and visual interest. Slide your jar into the cardboard tube throughout the process to make sure that it still fits inside, and is easily removable. Continue adding cardboard pieces until your jar is fully hidden. Once your jar is hidden, slide it out of the cardboard tube and allow the glue to dry overnight. This will ensure that the jar is removable for easy cleaning. Then experiment with different size jars. I also use one on my desk for pencils. I love this idea! Looks really cool and is also conserving!